From: Cervantes: Bulletin of the Cervantes Society of America 12.1 (1992): 105-10. ABLO Picasso's insightful, sassy, ubiquitous, black on white drawing of Don Quixote has to be considered a minor masterpiece (Fig. 1). It certainly is one of the most popular graphic representations known of Cervantes's wondrous character (the Cervantes Society has used it on its Newsletter). A black nut and bolt statuette of our knight, five inches long and nine inches high, very skillfully designed and welded by an unknown craftsman and sold in souvenir stores in Spain (I bought mine in Barcelona) in the early fifties, should rightfully deserve equal praise (Fig. 2). I am convinced that Picasso, whose sharp, roving eye constantly searched for likely subjects and was not hesitant to borrow from others, got the idea for his unique drawing of Don Quixote from this metal artifact. The reader can judge for himself or herself of the likelihood of this. a small headline on its first page proudly announced Un document exclusif: Don Quichotte vu par Picasso. The drawing takes up an entire page (12), and at the bottom appears this announcement: Un tirage spécial de ce dessin de Picasso sera mis en vente au stand des LETTRES françaises à la fête de l'Humanité le 4 septembre à Vincennes, ainsi qu'aux prochaines Six heures du livre du Comité National des Ecrivains. Proceeds probably went to help the Communist cause in France. 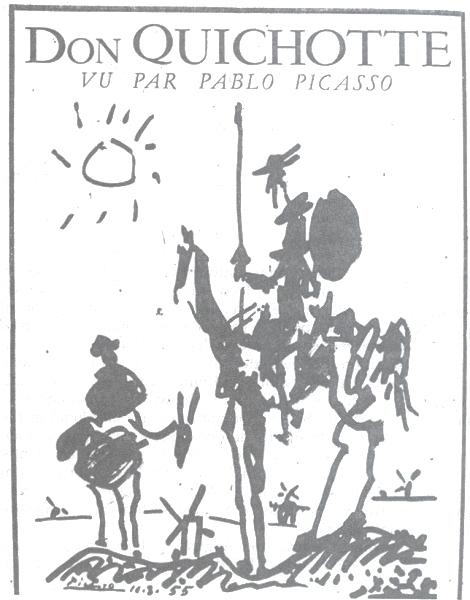 Picasso had attended a corrida on August 7 at Vallauris (the notice appears in the same journal on page 8), and three days later (the drawing is dated), according to Timothy Hilton (Picasso, New York, Praeger Publishers, 1975, 64) sketched his Quixote for his friend, Pierre Daix, who ran the magazine. Either there in southern France where he lived and worked, or in Spain, I surmise Picasso saw (or had seen) and perhaps even purchased the striking statuette which he can have used as a model. The artist's rendering, evidently sketched in a few minutes, is remarkable. 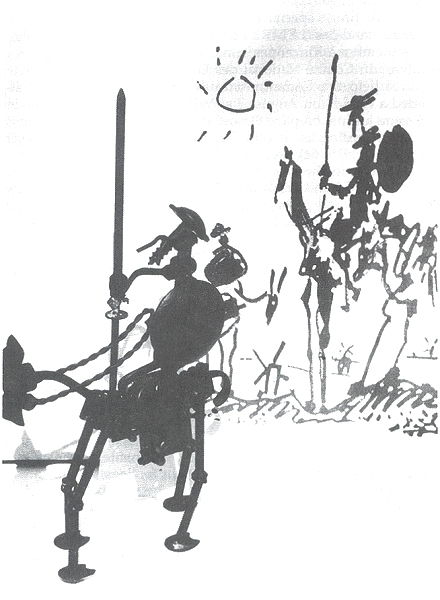 Don Quixote and Sancho appear silhouetted on a white background upon which shines a lop-sided sun. Several windmills are seen on the horizon. The figure of Don Quixote sits, elongated, gaunt, even somewhat deformed (this is not one of Picasso's cubist type works), astride Rocinante. I say deformed because the knight's body parts, suggested with heavy strokes of charcoal or paint, seem to have been changed once or twice as the artist formed the torso, arms and shoulder. The knight's head, capped by what would be Mambrino's helmet, is connected to his shoulders by a neck made with a single, thin line, and it sports a pointed nose and a long, equally thin goatee. He carries a lance in his right hand and the reins and a circular shield apparently in his left. Rocinante is the bag of bones described by Cervantes: long, thin forelegs, a haunch that looks transparent for the right thigh can be seen behind the left, and with rough lines and shading that suggest girth, loin, croup, and saddle. Sancho appears to the left, a black mass vaguely defining his round body, and sitting on Dapple who has a long, wiry neck and thin, long ears. Little attention seems to have been paid to Sancho (for whom I know of no model), sketched in the same vein, perhaps because Don Quixote is the center of attention. Though the two figures seem to be standing still, the drawing is full of movement; the lines are exuberant and the overall effect is catchy and one of bright humor. As one turns to the statuette, one is struck by the similarity of the stance and structure and the equally humorous bent of the nut and bolt contrivance. Don Quixote's head is made of an oval-head, non-slotted, wood screw which at the same time gives form to his beard. The head of the screw becomes the top of Mambrino's helmet, while the body of the screw is thrust through a large washer which becomes the brim of the helmet. The washer is cut to form the indent of a barber's basin. The head is finished off with an opened cotter pin which serves as the moustache. The torso is made of a bolt which runs from Don Quixote's seat, a nut with washer, to his neck which is welded along with another small washer to the screw that forms the head. The shoulder is made with a small nut below which are welded the arms, made of nails. The legs are of bent nails beginning at the seat and ending in stirrups of washers welded to the saddle, a small hinge. Rocinante's legs are of thin machine bolts welded at the elbows, while his neck and tail are of nails attached to a device that looks like a long, ribbed hinge which serves logically as his loin. His head consists of a wing-nut, washer, and nut. The shield appears to be a metal cap, the reins of twisted wire, the lance of two nails, a nut and a washer. The sculpture is a very ingenious, effective, funny representation of our knight, and surely one to catch the eye of any passer-by, not alone that of a keen observer like Picasso who was always visiting shops, interested in the work of local craftsmen. century, was not copying or plagiarizing, but playfully toying with variations of known artistic themes. Timothy Hilton in the quote mentioned above also suggests that Picasso was perhaps thinking of Daumier.